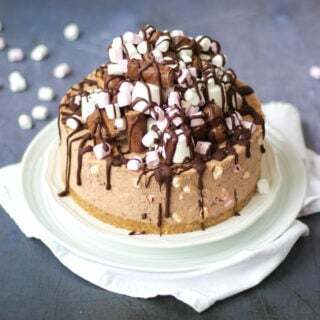 An easy No Bake Rocky Road Cheesecake Recipe - A chocolate cheesecake packed with marshmallows and topped with melted chocolate. No bake buttery biscuit base with cream cheese and whipped cream topping. Mix the whipped double cream, icing sugar and cream cheese until fully combined. Stir in the melted cooled and chocolate and mini marshmallows. Spoon on top of the biscuit base. Smooth the top with the back of a spoon or a palette knife if you have one. Chill for at least 3 hours or even better, over night. Pile the additional marshmallows and chocolates on top. Melt your dark chocolate and when slightly cooled drizzled on top.